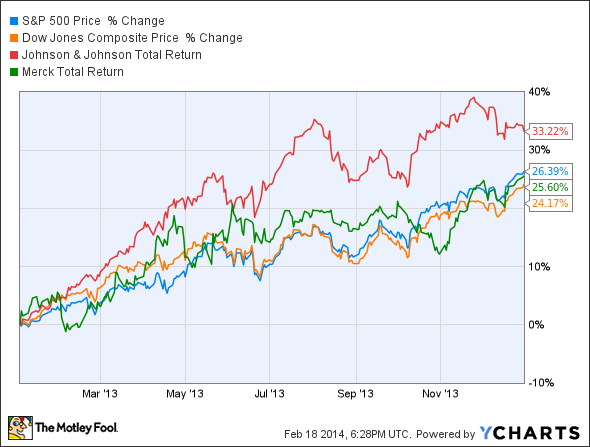 Dow Debate: Can Merck & Co., Inc. Chase Johnson & Johnson In 2014? After a strong start to the year, can Merck (NYSE: MRK) beat Johnson & Johnson (NYSE: JNJ) in 2014? Last year saw shares in Merck (NYSE:MRK) unable to keep pace with sector peer Johnson & Johnson (NYSE:JNJ), as the latter posted total returns of 33.2%, while the former was only able to deliver a total return of 25.6%. The total returns of the two main indices, meanwhile, were 26.4% (S&P 500) and 24.2% (Dow). Indeed, 2014 has seen the trend of 2013 turned upside down, with Merck significantly outperforming Johnson & Johnson in the first six weeks of the year. Merck is currently up 11.6%, while Johnson & Johnson has fared only slightly better than the S&P 500 (Johnson & Johnson is up 0.9%, while the S&P 500 is down 0.4%), with the Dow being down 2.5%. Can Merck continue to outperform through 2014, or will its chase of Johnson & Johnson end in failure? The fascinating aspect of the share price performance of Merck and Johnson & Johnson in 2014 has been that Merck has delivered disappointing fourth quarter results, while Johnson & Johnson's results were far better. For instance, Merck's net profit fell by 14% in the fourth quarter, while Johnson & Johnson's bottom line grew by 5.5% when compared with the fourth quarter of 2012. However, it is the former and not the latter whose share price has significantly outperformed the market in 2014. Of course, the disappointing figures from Merck were widely expected, and it is likely that they were priced in, explaining (to some degree) the relatively poor share price performance in 2013. The main reason for the decline in profits is generic competition, with Merck suffering from patent expiry and the subsequent loss of profit as margins are competed away. However, this challenge is one Merck faces exclusively. Jonson & Johnson is also facing challenges of its own with regard to generic competition but, unlike Merck, Pharmaceuticals account for around 40% of its revenue, with Medical Diagnostics and Consumer Goods making up the remaining 60% (split 40/20). This means that Johnson & Johnson's profit is better-shielded from patent expiries and, as such, its profits are likely to be more resilient, if less spectacular, in the long run. Still, both companies are pushing hard to overcome their patent woes. Merck, for instance, continues to experience positive updates from its pipeline of drugs, with lambrolizumab being designated a Breakthrough Therapy for patients with advanced melanoma, for instance. Meanwhile, Johnson & Johnson has had success with FDA approvals for ibrutinib (lymphoma) and simeprevir (hepatitis C), while canagliflozin (type 2 diabetes) was approved in Europe. The company is also seeking to grow its non-Pharmaceuticals capability and has raised capital already in 2014 through the sale of its blood testing unit to Carlyle Group for just over $4 billion. Both companies easily beat the S&P 500 yield of 1.96%, with Johnson & Johnson yielding 2.5% and Merck yielding 3.1% (all TTM). Both companies are being relatively conservative with regards to the proportion of earnings paid out as dividends, with Johnson & Johnson paying out 42% of profit as a dividend, while Merck paid out 49% in 2013. This highlights the conservative stance adopted by both companies, since earnings per share (EPS) are forecast to grow by just 7.5% for Merck in the next two years (although this could be due to a share buyback, as net profit for the company is set to fall). Meanwhile, Johnson & Johnson is forecast to deliver EPS growth of 13.7% over the next two years and is set to grow dividends per share by 24% over that period. While this would increase the payout ratio, it would still be just 45% in 2015, which seems conservative for a well-diversified, major health care stock. Interestingly, sector peer, Bristol-Myers Squibb (NYSE:BMY), pays out around 77% of net profits as dividends. It yields 2.6% and, despite a forecast for EPS to fall by 7% in the next two years, dividends per share are expected to be increased by 5.2% over the same time period. This highlights the difference in policies of the three companies, with Bristol-Myers Squibb choosing to divest assets (such as the diabetes alliance with AstraZeneca) to reinvest in the business, rather than reduce the payments it makes to shareholders. Although it had a challenging fourth quarter of 2014, Merck looks well placed to chase Johnson & Johnson in 2014. Sure, it needs to generate positive news flow from its pipeline, as this is the key to its future performance. However, its pipeline is encouraging and has the potential to turn the business around. Johnson & Johnson remains a relatively stable stock and should have a strong 2014, with both stocks having the potential to beat the S&P 500 and the Dow this year.